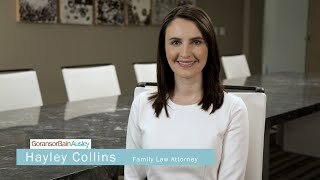 In her practice, Hayley Collins provides the full range of family law counsel to her clients, with a special emphasis on complex custody and property cases. Hayley enjoys representing a diverse spectrum of clients, including professionals, executives and their spouses. Hayley successfully helps clients reach agreed resolutions that are in their best interests. Hayley brings creativity and legal expertise to clients with unique custody issues, such as special needs children, parents who travel frequently, parental addictions, and parents or children with mental illness or other health issues. Prioritizing the needs of children, she helps parents develop customized parenting plans that address the specific needs of their family. Hayley also has an affinity for property cases, including cases that involve business interests, executive compensation, and other complex assets. She is skilled in helping clients to identify, characterize, and value assets, to trace and confirm their separate property, and to favorably divide marital property. Hayley is a strong advocate of mediation. She believes it offers clients the benefit of extended time to negotiate and reach agreement, and allows them to remain in control of the process. Hayley is also trained in Collaborative Law, adding to her experience in alternative dispute resolution. Whether through an out of court settlement or litigation, Hayley informs and guides clients to reach a constructive and efficient resolution. Known for her preparation and analytical skills, Hayley received her undergraduate degree from Southern Methodist University, and graduated from St. Louis University School of Law, where she was a Dagen Fellowship Award Recipient. Away from her practice Hayley serves as an enthusiastic mentor with Big Brothers Big Sisters.